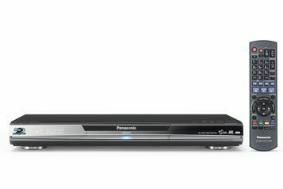 Panasonic to launch Freesat HDD Blu-ray recorder in May | What Hi-Fi? Prices will be approximately 400 Euros for the 'BD80, 350 Euros for the 'BD60 and 799 Euros for the portable 'B15. The DMP-BD80 is equipped with Viera Cast internet connectivity, a 7.1 analogue output, SD memory card slot, USB socket and Viera Link remote control. It also has a special 'playback information' function on the menu that enables the user to see the frame rate in mbps, type of soundtrack, quality of the video signal and other technical information on the Blu-ray disc being viewed. The latter function, and 7.1 analogue output, are absent on the cheaper DMP-BD60. As part of its Blu-ray strategy for 2009, Pioneer will also introduce four new Blu-ray home cinema in a box systems. The flagship model is the SC-ZT1 with wireless speakers. It's a 2.1 system as standard, but additional wireless rear speakers are optional to make it a full 5.1 system. It will be joined by the slimline SC-BTX70 2.1 system, and two more conventional 5.1 Blu-ray home cinema systems – the SC-BT205 and SC-BT200. All four systems will handle high-definition audio, have Viera Cast network capability, SD card slots for transferring digital media and support BD Live content. The SC-BTX70 also comes with a built-in iPod dock. On the TV front, there are no fewer than five ranges in the 2009 Viera plasma line-up: X, S, G, V and Z models. Z1 series: flagship Neo PDP model, just 1 inch thick, Full HD/1080p wireless connectivity, aluminium finish, new V Real 4 Pro Driver processing, 600Hz intelligent frame creation, 54 and 46in, launches in June. V10 series: Full HD, 42 and 50in Neo PDP models with 24p Smooth Film, THX certified. G15 series: Full HD, Neo PDP, supports DiVX, DNLA networking and Viera Cast. G10: entry-level Neo PDP models in 42, 46 and 50in sizes. X10 series: entry-level, HD-ready, V Real 4 processing, 100Hz double-scan models in 50, 42 and 37in (not Neo PDP). We expect to get more details of the full Viera TV line-up, including the LCD models, and a demo of the Freesat HD/Blu-ray recorder tomorrow. More information to follow as soon as we get it.